The difference between a concept & a constraint, part 1: What is a concept? 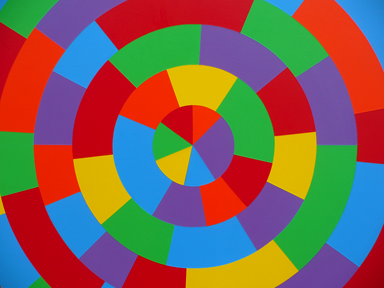 Sol LeWitt: “Wall Drawing #1111: A Circle with Broken Bands of Color” (2003, detail). Photo by Jason Stec. One direct predecessor of contemporary conceptual writing is Oulipo (l’Ouvroir de Littérature Potentielle), a writers’ group interested in experimenting with different forms of literary constraint, represented by writers like Italo Calvino, Georges Perec, and Raymound Queneau. One example of an Oulipean constraint is the N + 7 procedure, in which each word in an original text is replaced with the word which appears seven entries below it in a dictionary. Other key influences cited include John Cage’s and Jackson Mac Low’s chance operations, as well as the Brazilian concrete poetry movement. What, then, distinguishes concepts from constraints? And why does that distinction matter? In this series of posts, I’ll try answering those questions, starting with what we mean when we call art conceptual. I always thought a prince-nez was a nose ring. Is it really so hard for yachtsmen to think outside the boyfriend?